With Halloween fast approaching, the number of shoppers on the Oya Costumes e-commerce sites grows daily, reaching peaks for the year. Up to 70% of the annual online revenue for Oya Costumes lies in the balance during the critical Halloween season, making customer conversion incredibly important. Oya Costumes is Canada’s finest internet costume business selling fun, costumes, hats, makeup, decor, masks, shoes and lots more. The company has sold products online for 10 years and operates 3 different sites powered by EasyAsk - a U.S. English site, a Canadian English site, and a French Canadian site. The Oya Costumes sites run on the NetSuite Ecommerce platform. Oya Costumers offers over 6,000 products on its e-commerce sites. In 2014 Oya Costumes added over 1,500 new costume designs, many licensed from new licensors over a large number of new themes and characters. This created a big challenge for the online merchandising team. Shoppers needed to find products in many different ways – by character, theme, licensee, category, size, color and more. A recent e-commerce search usability benchmark study by the Baymard Institute  showed that 54% of the top 50 U.S. e-commerce sites did not support "thematic searches" (searches around themes or concepts) and 50% did not support "relational searches" (searches using terms that are related to the items). 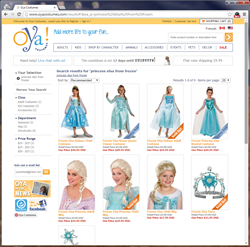 With EasyAsk, Oya Costumes offers search with the utmost flexibility, supporting searches using themes ("1970s women's disco costume") and terms related to items such as various characters ("Princess Elsa from Frozen costume"). "The very nature of our products and the various ways shoppers try to find the right product makes our business very unique and challenges our online team," said Faten Hodroge, owner and President of Oya Costumes. "In order to best service our customers, we have to offer search with extreme flexibility that allows shoppers to find the products they are seeking in their own way." EasyAsk's ability to support more sophisticated search terms and ease in adding search synonyms played an important role in Oya Costumes getting the new and existing products onto their site and giving shoppers an easy search experience and richer site navigation. EasyAsk's integration with NetSuite Ecommerce made the EasyAsk rollout swift and immediately adds new search capabilities as additional products are added to the Oya Costumes NetSuite catalog. Oya Costumes sites are in two different languages – English and French – and support two different currencies – U.S. dollars and Canadian dollars. EasyAsk's internationalization support and its' multi-currency capability played a strong role in Oya Costumes selecting EasyAsk for their e-commerce sites. The Oya Costumes site relies heavily on navigation powered by EasyAsk. "We were pleasantly surprised to find out our left column navigation, implemented by EasyAsk, is heavily used by our online customers," said Faten Hodroge. One extremely helpful feature is that EasyAsk allows customers to filter their search by size, color, type and other attributes. This makes it possible for customers to easily find what they are looking for." "EasyAsk has surpassed our expectations and allowed us to deliver a wonderful online shopping experience for our customers," added Faten Hodroge. "The EasyAsk team has been highly proactive in servicing our needs and ensuring our success." EasyAsk is the leading provider of e-commerce site search, navigation and merchandising solutions for e-retail, mobile commerce and B2B commerce. EasyAsk products go far beyond traditional site search, delivering unprecedented accuracy and precision to deliver the right products on the first page every time. EasyAsk voice mobile search gives freedom of speech to shoppers on mobile commerce sites, allowing them to search by speaking to their mobile device. Customers that use the EasyAsk software see a tremendous boost in online revenue through increased conversion rates, improved customer experience and agile merchandising. Based in Burlington, Massachusetts, with offices in Europe, the EasyAsk solutions are used by leading e-retailers and e-commerce sites such as The North Face, Samsonite, Anna's Linens, Journey's, Aramark, JJill, True Value, Andertons Music and Sonic Sense. For further information please visit http://www.easyask.com.